The Genesis Drip Irrigation System was created for gardeners and growers who are looking to conserve water consumption by delivering the right amount of water directly to the root system of the plants. Each of the Genesis Drip Irrigation Systems are designed for specific projects to make it easier to select the system that is right for you. Genesis also offers additional accessories to allow for the grower to customize their own system to fit their own personal needs. This kit is A PLANTER DRIPPER KIT, DESIGNED FOR BALCONY AND HOBBY GREENHOUSE PLANTS. This kit is designed for growers looking for a custom drip system. Our kit allows for the owner to cut and insert the dripper heads where they need them. Easy to install porous sprinkler hose for daily gardening: the 30.5 m (100 ft) irrigation hose is ideal for a garden-front or standard backyard and is presented in a package with four fittings. Once the hose is in operation, the patented water regulator controls the internal PSI to ensure that the plants receive a sufficient amount of water daily. Customizable 33 ft. Planter/ Container Dripper Kit The Genesis Drip Irrigation System was created for gardeners and growers who are looking to conserve water consumption by delivering the right amount of water directly to the root system of the plants. Each of the Genesis Drip Irrigation Systems are designed for specific projects to make it easier to select the system that is right for you. Genesis also offers additional accessories to allow for the grower to customize their own system to fit their own personal needs. This kit is A PLANTER DRIPPER KIT, DESIGNED FOR BALCONY AND HOBBY GREENHOUSE PLANTS. 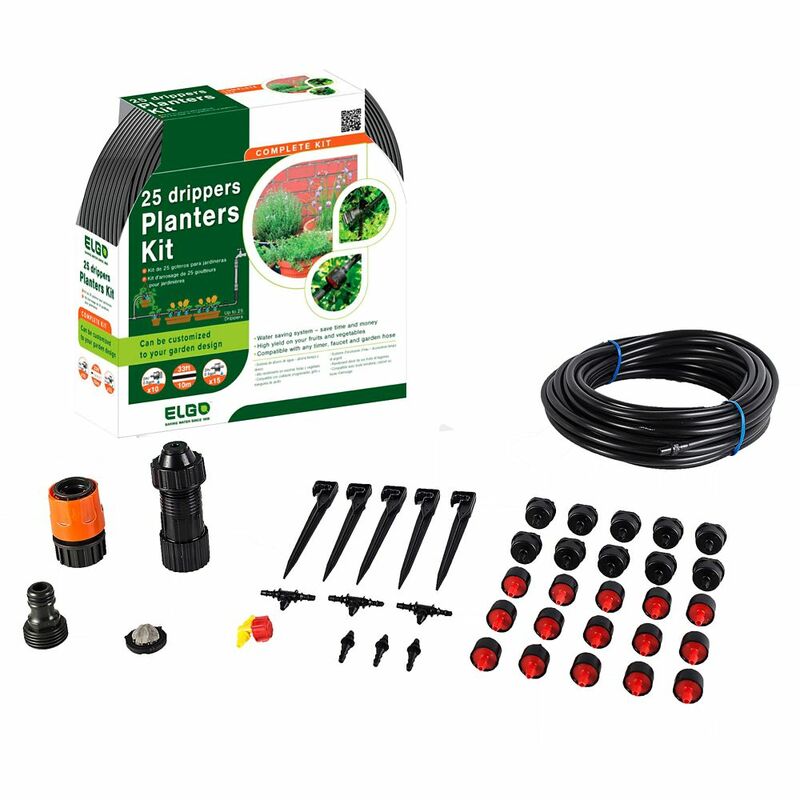 This kit is designed for growers looking for a custom drip system. Our kit allows for the owner to cut and insert the dripper heads where they need them.